London's Fleet Street Studio offers live TV broadcast facilities. London, June 2016: Fleet Street Studio - which is new to promoting its services on TVZ - offers clients a multi-camera studio in the former Reuters building at 85 Fleet Street. 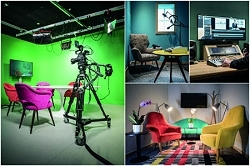 The studio is fully equipped for live broadcasts with connectivity to BT Tower, a green screen, infinity wall, autocue and production gallery. The edit suite has Avid Media Composer and Adobe Creative Cloud and a shared media storage server.